Courtesy of @GreatDismal, Eric Lusito's amazing photographs of abandoned Soviet military bases collected in After the Wall: Traces of the Soviet Empire. Like supersonic Ilya Kabakov installations, ruins of a lost 20th century utopia that you thought you imagined. CHESTERTOWN, Md. -- Science Fiction & Fantasy Writers of America will descend on Coco Beach, Fla., on Cape Canaveral for the 2009 Nebula Awards® Weekend May 13-16. The date was chosen to coincide with the scheduled launching of the Shuttle Atlantis on Friday, May 14. The Nebula Awards will be presented at a banquet on Saturday evening, May 15. The Nebulas will be held at the Hilton Cocoa Beach Oceanfront, just 20 minutes from the Kennedy Space Center. The Friday launch of the shuttle Atlantis will be visible from the beach outside the hotel. There will also be special tours of the Kennedy Space Center available to Nebula attendees as well as various panels and workshops of interest to the science fiction and fantasy community. During the Saturday night banquet, Nebula Awards will be given for best short story, novelette, novella and novel. Other awards to be presented are the Andre Norton Award for excellence in science fiction of fantasy for young adults, the Bradbury Award for excellence in screenwriting and the Solstice Award for outstanding contribution to the field. Renowned author Joe Haldeman will also be honored as the Damon Knight Memorial Grandmaster. The author of 20 novels and five collections, Haldeman remains one of the most popular science fiction writers working today. His landmark novel, The Forever War, won the Nebula, Hugo and Ditmar Awards for best science fiction novel in 1975, and spawned two follow-up novels, Forever Peace and Forever Free. In total, his writings have garnered him five Nebulas, five Hugos and a host of other awards as well as numerous nominations. The 2010 Nebula Weekend is open to all. Members of the Science Fiction and Fantasy Writers of America receive a discount. Early registration is recommended as space is limited and prices will go up on Monday April 5. For more information, visit www.nebulaawards.com and www.sfwa.org. This is one of the newest buildings in Houston's Medical Center. 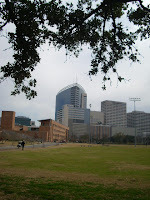 Seen from Rice University, it looks like a the prow of a ship to me. In fact, it never fails to remind me of the King of the World scene from the movie Titanic. Actually it's Methodist Hospital's new Outpatient Care Center; and I'm fairly sure it's not fated to hit an iceberg and sink. I recently had the pleasure of watching the Alex Rivera film Sleep Dealer, an amazing work of Mexican cyberpunk about info-maquilas and memories for sale in near-future Tijuana. One of the more over-the-top plot elements was a reality television show in which viewers help drone pilots select their terror targets. This morning's NY Times has an amazing report about the Pentagon's struggle to figure out how to process the huge quantities of data it is receiving from the proliferating network of Predator/Reaper drones patrolling the skies of the earth. Last year the drones were in the air for 200,000 combat flight hours, each generating a constant feed of live video and other data. That content is amount to exponentially increase, not only through the addition of more drones, but through the addition of eyes. This year the Reapers will be able to begin recording video in ten directions at once. Next year it will increase to 30 directions at once, and after that, 65. That's a lot of eyes in the skies. To better harvest the actionable intelligence contained in these planetary surveillance tapes, the brass in charge of the Geospatial Intelligence Agency has been hanging out in ESPN broadcast vans, learning how football game video is transformed into a real-time data feed that gives the viewers a better understanding of the totality of what's happening—through a mix of text, live video, replays, and graphical augmentations of the filmed reality—than most of the coaches probably have during the game. Government agencies are still having trouble making sense of the flood of data they collect for intelligence purposes, a point underscored by the 9/11 Commission and, more recently, by President Obama after the attempted bombing of a Detroit-bound passenger flight on Christmas Day. Mindful of those lapses, the Air Force and other military units are trying to prevent an overload of video collected by the drones, and they are turning to the television industry to learn how to quickly share video clips and display a mix of data in ways that make analysis faster and easier. They are even testing some of the splashier techniques used by broadcasters, like the telestrator that John Madden popularized for scrawling football plays. It could be used to warn troops about a threatening vehicle or to circle a compound that a drone should attack. Pretty interesting stuff. But how much are the dudes in the DOD trailers in Orlando going to be able to do with the multiple "games" represented by several hundred or thousand drones in the air at any one time? Isn't the more likely result the birth of the ultimate in open source intelligence — an application of the SETI@home distributed computing model to fighting the war on terror? Imagine if the Pentagon set up a separate YouTube channel in which the raw video was made available (even if only on a time-delayed basis for ex post facto analysis) to the general public for analysis? If the FBI has an iPhone app for information on the most wanted terrorists, how much of a leap would it be for DOD to turn the aerial surveillance of the brown highways of the Yemeni interior and the black spots on the map of Waziristan over to the enthusiastic entrepreneurs of augmented reality apps? Let the zeitgeist achieve what it wants, and allow the private sector to turn the video into the basis of a real-world tactical game, in which teenage boys in suburban Chicago tag the Talis for special attention. Over the holidays I went to Georgia to look after my mom's financial and health affairs, and my Georgia cousins graciously gave me a guest room to stay in and a pickup truck to drive, but the latter turned out to be just a bit problematic. Cousin Roy acquired the truck at auction and thinks it previously belonged to a drug dealer, which explains the rather heavily tinted windows. I'm not a heavily tinted vehicle window person. On top of that, the front license plate holder (Georgia doesn't require front license plates, so people put on whatever they please) has a plate emblazoned with the 1956 Georgia flag. That flag incorporates the Confederate battle flag. And my cousin had a FOR SALE sign in the front window. So I - an emphatic liberal - was driving something that suggested a very different kind of driver. I visited Trinity Episcopal Church for a Sunday service. A pedestrian parishioner seemed delighted to see me pulling into the parking lot. I must have looked like a potential convert on the hoof. The little green truck's radio worked quite well. My cousin may have been startled to find it tuned off his favorite country station and onto Georgia Public Radio. When I took my mom to her hair stylist, she hopped right in. Mom suffers from Alzheimer's and some coordination difficulties, but the little green truck has a handy grab handle on the passenger side. Mom likes it when Roy takes her places in it. Long story short, the truck was good, the truck wearing a Confederate flag not so much. Nobody visibly bristled at me, but still. Some white Southerners cite the Confederate flag as a kind of ancestral icon. Maybe so and maybe no. It might be one thing to honor your ancestors' flag in the privacy of your home, but it's another thing to flash it on Southern streets. I was interested to see if it turned up anywhere besides on the front bumper of the little green pickup truck. It did. When I took an afternoon walk in the park, the winter day had a clear stillness, like the surface of the park's lake, a reflective calm - except in the one area: the vicinity of two young white men in a mud-crusted pickup truck flying a Confederate flag and blaring country music. Said flag is in the middle of the photo.